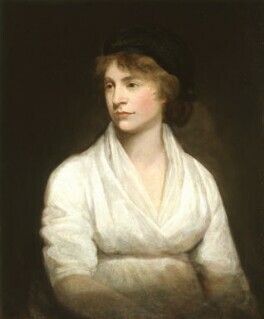 Mary Wollstonecraft was thirty-eight when this portrait by John Opie was painted in 1797. He had known Mary for some years, and admired and sympathised with her, which I think shows in the painting. I suppose her face could be described as handsome rather than pretty or beautiful. The direct gaze, straight nose and wonderfully generous mouth, curling up at the corners, make me long for her to turn and smile at me. It is a face that radiates intelligence and intellect. There is no nonsense about her dress either, plain white muslin, no jewellery, a fresh complexion and hair naturally framing her face. I have seen other portraits that have tried to prettify Mary, and bring her nearer to the conventional standards of beauty of the time, but although we’ll never know for certain, I feel John Opie’s portrait has captured her. This courageous woman, who wrote A Vindication of the Rights of Women, travelled, witnessed and wrote of the terrors of the French Revolution, was the mother of one illegitimate daughter, married William Godwin, and finally died after giving birth to their child. William had this portrait hanging above his desk. In the Gallery they are placed side by side, and Mary is opposite the portrait of the daughter she never knew, another Mary, who went on to marry Percy Bysshe Shelley. There is something touching about seeing them all together at last. on stage and screen. Her recent film credits include Iris, Calendar Girls and Shaun of the Dead and she has also appeared in numerous television dramas. In 1997 she received the Irish Theatre Best Actress Award for A Kind of Alaska at the Donmar Warehouse. She has made numerous appearances on the London stage, most recently in the critically acclaimed production of The House of Bernarda Alba at the National Theatre.